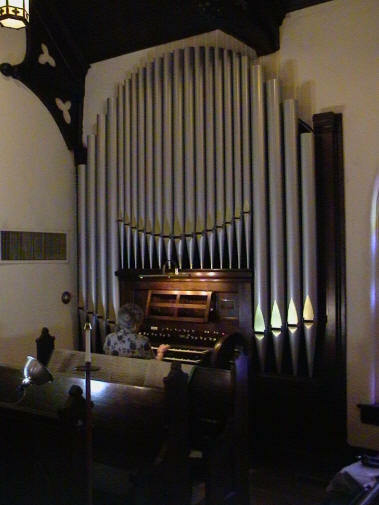 In 1901 Grace Episcopal Church built the chapel, which currently houses Cornel Zimmer Organbuilders, opus number 83. The original organ in the chapel was built by the Pilcher company only a few years after the building was erected. Originally built as a tracker (mechanical action) instrument, the organ was later converted to electro-mechanical action. When the new sanctuary was built in 1987, much of the pipework from the Pilcher was used in new organ in the sanctuary. Of the original organ, only 3 ranks remained, a Principal 8’ in the great, Gemshorn 8’ (from tenor C) in the Swell, and a 16’ Bourdon, which overpowered the remaining stops. What remained of the organ provided little support for singing and lacked flexibility for registration. Mechanical problems also hindered use of the organ. In June of 2004, Grace Episcopal Church contracted with Cornel Zimmer Organbuilders to provide a new digital organ for their Chapel, reusing the original casework and console. The wind chests and remaining pipe work were removed and the casework was carefully dismantled and transported to Denver, NC to be refinished. After the organ was removed, the chamber was cleaned and the chamber painted black. The existing casework was restored and refinished in our shop by our finishing expert Marty Lemons to match the existing woodwork in the church. New façade pipes were also handmade in our shop by our pipe maker, Tommy Linder. Two refurbished keyboards were added and a 32-note pedalboard replaced the existing 30-note pedalboard. Eric Molenaar and Nathan Bryson wired the new organ, and Jim Twyne voiced the organ upon installation. The new organ consists of 10 stops and 11 ranks, over two manuals and pedal. A combination action with over 100 levels of memory provides the organist with great flexibility for registration, and the organ can now support a healthy music program.